in the palani hills, June 2012. Originally a Hamburger of highland-scotch origin Turner, who’s been musically active since 2001, had taken to stages far and near in the process of formulating his own cryptic interpretation of rap, before turning to singing. His prior successes include projects such as Meteorites and Puppetmastaz (for whome he still produces) which accompanied by a string of collaborative ventures and solo work, saw substantial publication throughout the UK, Europe and the U.S. This solo venture and new outfit, however, is the first occasion for him to present his skill and song-craft since withdrawing from stage 3 years ago. 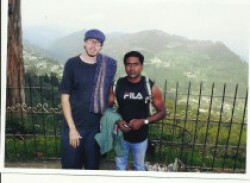 Toward the end of 2009, after wrapping up 5 years of near permanent road life Turner left his base in Spain, where he had lived nigh on a decade, for India where he took up classical Vocal training. Learning aspects of Hindustani and Dhrupad as well as the ragas and traditions of Carnatic music have much enriched his musical outlook after years of computer oriented production and club culture. A period of intense guitar practice, an instrument that always played a central role but he never exercised as part of his stage efforts, was also taken up prior to the creation of this new material. The Migrations are a loose cluster of musicians open to experimentation, guest performances and change of environment. Founded by Turner and drummer Eugine Yuvaraj. 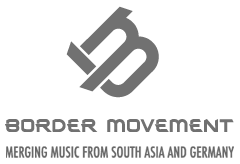 At present in the process of producing in various locations in South India the album release and a European tour are expected later in 2012. The remixes explore less obvious interpretations of the theme with Vogel offering a profound percussive version while mystery-man Midatlantic supplies a gritty break-beat version carved out of the original drum beat that sees a guest perfomance by Snuggles the bunny, of Puppetmastaz.